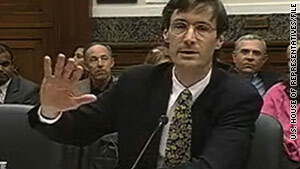 National Labor Relations Board appointee Craig Becker (shown in 2007) has drawn criticism from conservatives. Sen. John McCain: "This is clear payback by the administration to organized labor"
(CNN) -- One of President Obama's Saturday recess appointments to the National Labor Relations Board quickly triggered intense opposition from business groups and Republicans, who called the appointee a radical who represents a White House gift to labor unions. The fury is aimed at Obama's appointment of Craig Becker -- a labor lawyer -- to the NLRB, the federal agency that oversees relations between unions and employers. "Mr. Becker's prolific writings ... suggest a radical view of labor law that flies in the face of established precedent and case law and is far outside the mainstream," the U.S. Chamber of Commerce said in a statement Saturday. "This recess appointment disregards the Senate's bipartisan rejection of Craig Becker's nomination to the NLRB," said Randel K. Johnson, the chamber's senior vice president of labor, immigration and employee benefits. "The business community should be on red alert for radical changes that could significantly impair the ability of America's job creators to compete." Obama announced Saturday that he will make recess appointments of 15 nominees to administration posts who are awaiting confirmation by the full Senate. None has generated nearly as much outcry as Becker. The Republican National Committee sent out a memo Saturday titled "Union Bosses' Bailout Begins -- Recess Appointment Of Becker Payback From Obama To His Union Paymasters, With More Job-Killing Bailouts To Come." Becker is currently a general counsel for the Service Employees International Union and for the AFL-CIO. He has taught at the law schools of the University of Chicago and Georgetown University, among other places. Business groups and Republicans say that Becker has voiced support for skirting Congress to enact so-called card-check legislation regarding labor unions. They say that he has proposed that the bill be enforced through federal regulators such as the NLRB. The card-check bill -- officially called the Employee Free Choice Act -- would allow employees at a workplace to join a union if a majority signed cards. Opponents say the system is undemocratic because it discourages secret ballot elections. On Thursday, all 41 Republican senators signed a letter urging Obama not to appoint Becker, saying it would "bypass the advice and consent traditions of the Senate." Senate Republicans, along with two Democrats, effectively blocked Becker's nomination on February 9. "The president's decision to override bipartisan Senate rejection of Craig Becker's nomination is yet another episode of choosing a partisan path despite bipartisan opposition," said U.S. Senate Minority Leader Mitch McConnell. This is clear payback by the administration to organized labor. McConnell also objected to Obama's appointment of Mark Pearce, a labor lawyer, to the NLRB, because he said that both he and Becker are Democrats. "This is a purely partisan move that will make a traditionally bipartisan labor board an unbalanced agenda-driven panel," he said in a statement. Many other Republican lawmakers blasted Becker's appointment. "This is clear payback by the administration to organized labor," said Sen. John McCain in a statement on Saturday. "Time and again questions have been raised over Mr. Becker's ability to serve in an honest and impartial manner on the NLRB, yet this administration chose to ignore the questions and concerns and instead forced their will on the American people." Labor groups, meanwhile, applauded Becker's appointment. "When jobs are scarce, workers are often forced to endure unfair working conditions," said Kimberly Freeman Brown, executive director for American Rights at Work. "America's workers need a fully functioning NLRB to mediate their claims for better wages, benefits and other rights now more than ever -- and after two long years they have one."